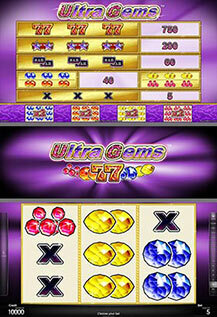 Taste a life full of luxury and experience a game like no other with „Ultra Gems™“. This glimmering 5-line and 3-reel game assures you great entertainment and fun. All prizes are for combinations from left to right and are on selected lines. Nine identical gem symbols trigger "Special bonuses" which double the win.